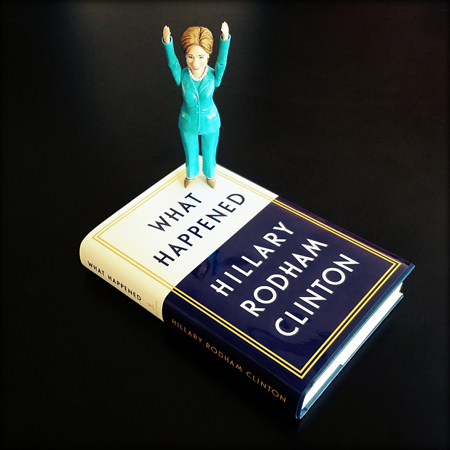 This is the eighth installment of the What Happened Book Club, where we are doing a chapter a week. So! Let us continue our discussion with Chapter Eight: Turning Mourning into a Movement. This was a tough chapter to read, because it is always hard to read the stories of young Black people killed by gun violence and/or police brutality, and the stories of children and educators and police killed by gun violence. It was also a hard chapter because it was the most "political" chapter so far. It's an indication of how truly politicized gun laws are in the United States that, in a book where Hillary Clinton is extremely personal, and in a chapter where she speaks so frankly about being moved and compelled by the Mothers of the Movement and gun violence survivors and parents of children killed in school shootings, here is where her words are most stilted and careful. I'm sure that some of my fellow Democrats will look at this high-priced onslaught and conclude, as many have in the past, that standing up to the NRA just isn't worth it. Some may put gun safety on the chopping block alongside reproductive rights as "negotiable," so as not to distract from populist economics. Who knows — the same might happen to criminal justice reform and racial justice more broadly. That would be a terrible mistake. Democrats should not respond to my defeat by retreating from our strong commitments on these life-or-death issues. The vast majority of Americans agree that we need to do more on gun safety. This is a debate we can win if we keep at it. Her greatest contempt, of course, was reserved for the Republican Party — and its president. She briefly but pointedly addressed the time Donald Trump suggested that the "Second Amendment people" find a way to stop her before she appointed liberal (anti-gun) justices to the Supreme Court. And of course her response was classic Hillary: "I was particularly concerned that if a 'Second Amendment person' came after me, he'd be coming after my security detail of Secret Service agents." If that doesn't tell you what kind of person Hillary Clinton is, I don't know what could. Trump calls for her assassination, and her particular concern is that it put in danger the people tasked with protecting her. That alone makes her more qualified to be president than Donald Trump ever could be. Although it's from the next chapter of What Happened, which we'll discuss in its entirety next week, I also want to take a moment to highlight the section on Matt Lauer and the Commander in Chief Forum, which I noted earlier as an example of Lauer's unequal treatment of Hillary Clinton and Donald Trump during the campaign. "The decisions a Commander in Chief makes can have a profound and lasting impact on all Americans, but none more so than the brave men and women who serve, fight, and die for our country." That was Matt Lauer introducing NBC's "Commander in Chief Forum" from the deck of the aircraft carrier U.S.S. Intrepid on September 7, 2016. I was standing just offstage listening to his introduction, nodding my head. Lauer promised the forum would be an opportunity to "talk about national security and the complex global issues that face our nation." That's exactly what I wanted. With Election Day just two months away, it was time to have a serious discussion about each candidate's qualifications to be President and how he or she would lead the country. This wouldn't be a formal debate with me and Donald Trump onstage at the same time. Instead, we'd each do our own thirty-minute session answering questions from Lauer and the audience. I was confident that with a real focus on substance and a clear contrast of our records, Americans would see that I was ready to be Commander in Chief, and Donald Trump was dangerously unprepared. Lauer and NBC were promoting this forum as a chance to finally get serious about foreign policy and national security. [...] He began with a broad question about the most important characteristic that a Commander in Chief can possess. I used my answer to talk about steadiness, a quality that nobody ever associates with Donald Trump. Lauer cut in to say, "You're talking about judgment." That wasn't what I was talking about, exactly, but it was close enough. "Temperament and judgment, yes," I replied. I've been around the block enough times to know that something bad was coming. Lauer had the look of someone proud of himself for having laid a clever trap. "The word judgment has been used a lot around you, Secretary Clinton, over the last year and a half, and in particular concerning your use of your personal email and server to communicate while you were Secretary of State," Lauer said. "You've said it's a mistake. You said you made not the best choice. You were communicating on highly sensitive topics. Why wasn't it more than a mistake? Why wasn't it disqualifying, if you want to be Commander in Chief?" It was disappointing but predictable that he had so quickly steered the supposedly high-minded "Commander in Chief Forum" to the subject of emails, months after the director of the FBI had announced there was no case and closed the investigation. I understood that every political reporter wanted his or her pound of flesh. But Lauer had already grilled me about emails in an interview back in April. I figured this must be about "balance." Here I was, facing the blurring in real time, with a charlatan waiting in the wings. But what could I do? I launched into my standard answer on the emails, the one I'd given a thousand times before. [...] Instead of moving to any of a hundred urgent national security issues, from the civil war in Syria, to the Iranian nuclear agreement, to the threat from North Korea — the issues this forum was supposed to be about — Lauer stayed on emails. He asked four follow-ups. Meanwhile, the clock was ticking, and my thirty minutes to discuss serious foreign policy challenges were slipping away. Finally, after learning absolutely nothing new or interesting, Lauer turned to a question from one of the veterans NBC had picked to be in the audience. He was a self-described Republican, a former Navy lieutenant who had served in the first Gulf War, and he promptly repeated the right-wing talking point about how my email use would have landed anyone else in prison. Then he asked how could he trust me as President "when you clearly corrupted our national security?" Now I was ticked off. NBC knew exactly what it was doing here. The network was treating this like an episode of The Apprentice, in which Trump stars and ratings soar. Lauer had turned what should have been a serious discussion into a pointless ambush. What a waste of time. Lauer was hunting her: He laid a trap and then he pounced. It was an ambush. At the time, many feminist political commentators noted that Lauer's behavior was profoundly misogynist, only to be (as per usual) shouted down and accused of seeing sexism where none exists. Let me be perfectly blunt: What we saw was Lauer behaving like a misogynist predator in ways that are familiar to women who study and document these patterns. At some point, it might be both wise and valuable to start listening to women.